Any kind of threat, assault, unforeseen emergency and major event can suddenly occur at any time MobiCall Client PC offers to desktop / PC as well as to virtual desktops the opportunity to trigger and receive alarms. There is a wide range of functionalities and performance features available for computer workstations. These functions allow a hidden and silent alarm release in the event of threatening situations by means of keyboard shortcut, mouse click or through external push-buttons. The application can also be used as a media for alarm transmission; thereby users can receive information via text, voice, audio and video message. 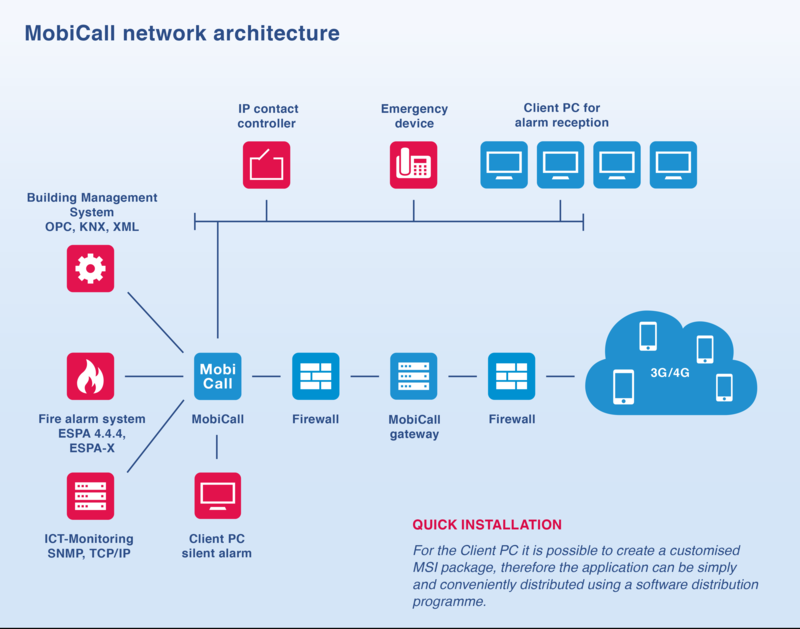 Learn more about how MobiCall supports you by protecting your customers, staff members and facilities. MobiCall Client PC is an integral part of the MobiCall solution. It acts as a central alarm and information platform, since it is the main focus of the communication process. Depending on events, MobiCall can interactively alert the respective employees, auxiliary staff, third parties, either on a group or individual basis, using all available media through voice, text and picture message. All existing process workflows can be considered within the framework of alarms and information distribution. The structure of this solution ensures high reliability and meets the highest safety requirements. So, the connection between the Client PC and the central alarm server can always be monitored. When the connection is down, both the user and the competent central authority are informed immediately. In case of emergency (such as fire or crisis alarms), an immediate mass alerting is required. The graphic user interface allows to employees, emergency responders, executives or safety officers to directly and intuitively trigger alarms or assign tasks at any time. Background quick start alarms can be automatically released according to the situation. Alternatively, the Client PC permits to create dynamic alarm messages, using individual components. In this context, also external attachments, such as building plans and PDFs can be attached. The integration of IP cameras is also possible, so that a video stream can be played in case of an alarm. most quick and reliable way possible. Emergency teams are informed via phone calls or PC of pop-up messages. Automatic teleconferences support the situation assessment and the determination of the appropriate response measures. 1. There are different options to trigger a silent alarm. This can occur through an individual keyboard shortcut (e.g. Alt+1), in the form of a panic alarm by simultaneously pressing at least 3 keys, or even via mouse click using the MobiCall App, but also using an external Bluetooth or USB push button. 2. The central MobiCall server can identify and locate the Client via PC or username, IP or MAC address or even using the access point. 3. In case of emergency, MobiCall starts an individual or group-based alarming scenario. By that MobiCall transmits the event multimedially to a defined group of people, according to alarm and time plan, using, for example, internal and external extensions, smartphones, Client PCs, IP loudspeakers. Depending on the alarm configuration, the transmission of information can occur on a spatial, skill and priority basis, as well as in a simultaneous or sequential way. 4. To ensure of a maximum safety, a predefined number of recipients must acknowledge the alarm. If these people cannot be reached, the system can start an alarm escalation in order to notify further participants. 5. 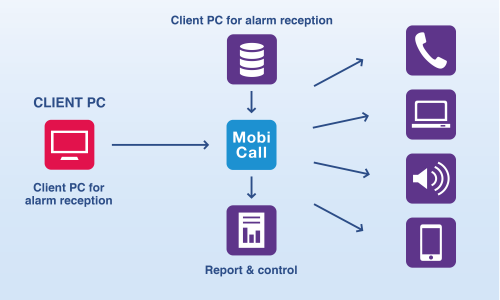 MobiCall logs detailed information about the whole alarm proceedings. The alarm report can be sent automatically but also retrieved through the alarm control panel at any time. All scenarios can be easily configured and managed either centrally or decentrally using the MobiCall application. The web-based Management Tool features an innovative “drag & drop” configuration tool and offers IT administrators, as well as group and department responsible users an intuitive and clear way to configure people and alarm parameters. The multi-client capability offers to different sectors the opportunity to independently manage to administer the own alerting organisation, through diversified access rights. Thanks to the external databases connection for the automatic import of master data significantly reduces the administrative workload. After having released the alarm, it is also possible to send the user a masked notice, to notify the successful alarm release, for example through a pop-up message like “Current meeting in the room 200”. According to the customer’s needs, it is also possible to trigger a time-delayed alarm, to give the user the opportunity to independently reset a false alarm. 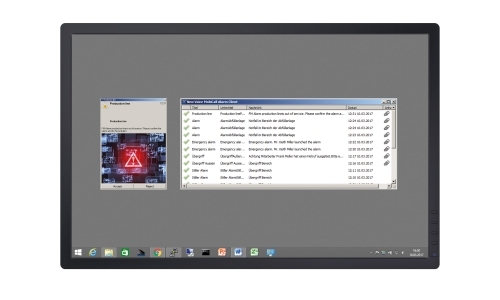 After an alarm being triggered, a video stream can be displayed automatically on recipients’ Client PCs. This allows a quick status report, while supporting the whole process aimed at defining the appropriate measures to be taken. Do you need more information about a specific application? Please do not hesitate to contact us to better understand how MobiCall could help you.